Wait. Is that…? No, it couldn’t be. Right? I mean, do they even make such a thing? They don’t, do they? But it looks exactly like…no. There’s just no way. That’s not even chemically, mechanically, culinarily possible. Is it? Well my friends, don’t second guess yourselves. You’re eyes were correct. That beautiful little bowl of creamy curds and whey is just what you think it is. 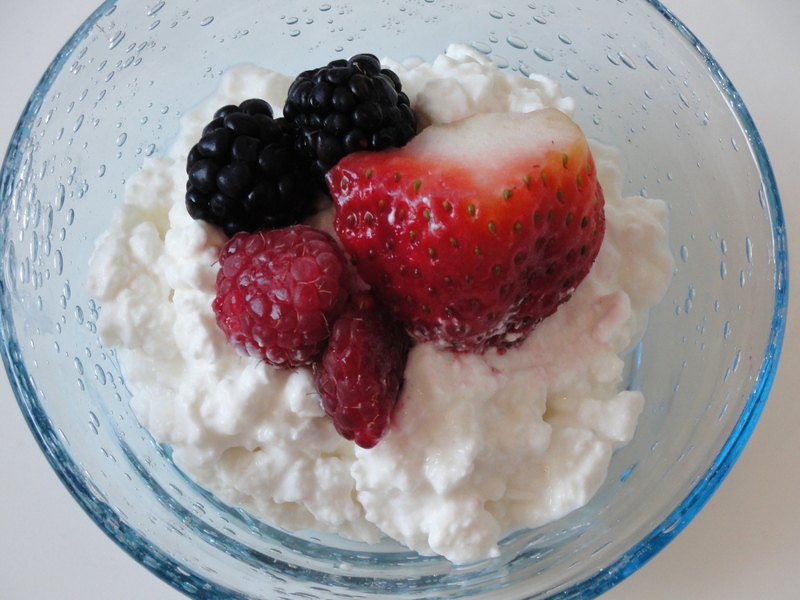 A heaping half cup of no salt added cottage cheese. I know. It’s like saying that cats can talk or that hover crafts exist. Which, at least for the hover craft, I hope is a true statement someday. But this particular picture is no figment of your imagination. It is a low sodium reality. While doing research last week, and yes, I now consider grocery shopping “research,” I was paddling through the yogurt and cottage cheese aisle, looking for suitable low sodium substitutions for these common breakfast foods. Originally, I thought I had found the winner in a tub of ricotta cheese, which has a similar texture to cottage cheese although a slightly less tangy taste. But at 20 to 50mg of sodium per serving (depending on the brand) and comparable calories, carbohydrates, and cholesterol, I thought it was a passable replacement. Then, I saw the words I will never forget. “No Salt Added.” Shining on the lid of a Lucerne, 2% milk container of cottage cheese. I checked the back label, a little nervous to find an extraordinarily high sodium count which usually occurs with “low sodium” soups. But there it was. A meager total of 45 mg for a half cup serving. Less sodium than an egg, which weighs in at 70 mg. And let’s face it, who only ever eats a single egg? Bring on the triple scramble skillet and pile it high with some cottage cheese. So now a few words on how to enjoy this treat. I love cottage cheese on its very own, but it is also a wonderful canvas for both savory and sweet flavors. 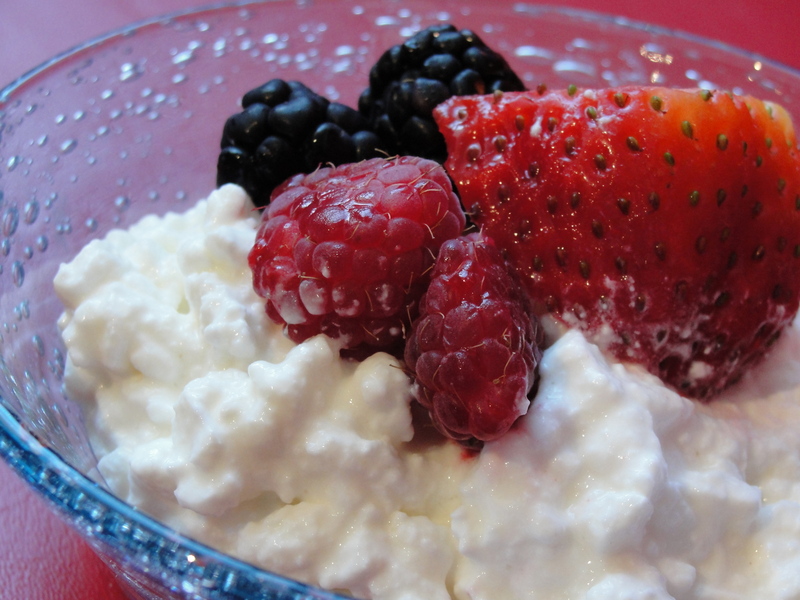 Berries and other drippier fruits, like pineapple or peaches, blend beautifully with the sour taste of the cottage cheese. If you are looking for something on the other side of the palette spectrum, throw on some unsalted nuts, like pistachios, and then top it of with a drizzle of honey, chutney, or fig preserve. The result is a colorful, crunchy, and slightly sweet treat. This combination also makes a charming appetizer when served on no salt crackers. If you want to take your cottage cheese one step further, use it in pastas, frittatas, and even bread. Possibilities. Endless. Before I close out for the week and wish you all a healthy weekend, I wanted to say hello to the new readers who recently found their way to the site – welcome – and briefly explain what this blog is about. 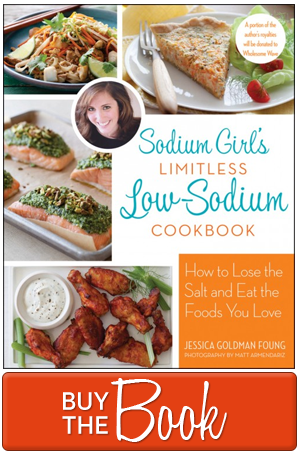 As you can see from this post, SodiumGirl follows my adventures in the world of low sodium food. Sounds exciting, right? Well, it is a lot more thrilling than one would expect. Due to Lupus-related kidney failure, I had to drastically change my diet and completely cut out the salt. 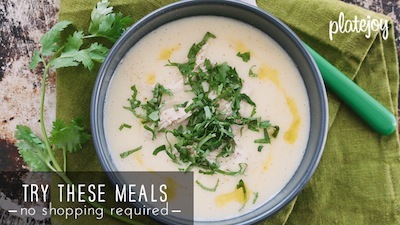 A task that required a lot of home-cooked meals and hours in the grocery store aisles. But as a San Francisco native and natural-born foodie, I was determined to not let this dietary exclusion keep me from enjoying the foods, restaurants, and people that make the Bay Area and life in general so exciting. After six years of constant research, experimentation, and detective-work, I now know how to make low sodium cooking work for me. And this blog is dedicated to imparting not only the information but the spirit that makes living a healthy life an enjoyable escapade. For those of you who are just beginning your journey, check out my Black Dress Theory for a different take on what the word “restricted” really means and don’t be shy. I love emails and would love to know the culinary queries that keep you up late at night. That’s all for today. I’m off to stuff my face with something good. Be safe, be silly, and be full. See you on Monday. Chow on. I have so enjoyed your site as you know. I realized reading your blog today that I had never asked about what your sodium intake in mg is per day. I don’t always keep a close count but am really aware of what I am eating all the time. I think I can easily hover between 500-1000. What kind of numbers do you strive for? Hope I can find that cottage cheese in my store! I am with you, Karen. From my best estimate I keep my sodium intake between 500 and 1000mg a day. I end up on the higher end when I eat a lot of meat (especially red meat) which I generally consume more than a 3oz serving in one sitting. I’m a beef and potato girl. But on the days that I eat grains and veggies, I imagine a hover around 500mg of sodium or below. So in terms of prepared foods, anything over 40 mg per serving seems to high to me. I’d much rather make it from scratch! I couldnt find that cottage cheese in my local store. I shop at healthy heart market for all my low sodium needs. I love healthyheartmarket.com as well and use it to order my favorite no sodium added BBQ chips and low sodium cheeses! Believe it or not, I am thrilled to learn of the low -sodium cottage cheese. My big complaint about the standard fair is that it is often too salty even for a person like me who doesn’t have the same need to live on a no-sodium added diet. I am going to go out and look for some this weekend! Hurray. And thanks for the good work you do. I just stumbled across this post about no salt added CC. Does this taste good? I have a memory of finding some, years ago, and it was *awful*…I decided then that it wasn’t worth it! Your blog is very informative and I am new to a low sodium diet.